Who made history as first Arab to summit Manaslu? Who is the first Arab to reach the top of the world’s 8th highest peak, located in the Himalayas. Dolores Al Shelleh has set another historic accomplishment as the first Arab to summit Mount Manaslu, at 8,156 meters above the sea level. The Sustainable City had appointed Dolores, the first and youngest Jordanian set to climb the Mount Everest, as its Brand Ambassador to raise awareness on sustainable living. With the company’s support, Shelleh ventured on the arduous task of scaling Mt. Manaslu, regarded as the fourth most dangerous for climbers, due to the risk of avalanches. 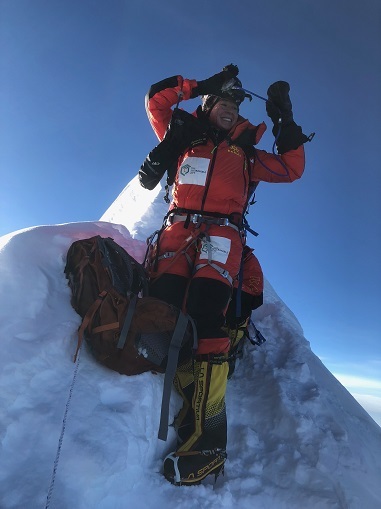 She scaled the peak in 40 days, braving biting cold and harsh conditions, with the temperature at the summit being a chilly -20-degree C.
Dolores has earlier summitted the Mera Peak in Nepal at 6,476 metres; Mt. Kilimanjaro, Africa’s highest peak at 5,895 metres above sea level; and Mt. Elbrus, the highest mountain in Europe, towering at 5,642 metres above sea level. She was awarded the ‘Sports Leader of Year’. Dolores expressed her happiness in scaling Mt. Manaslu, a task she said aimed at enhancing awareness of climate change and its impact on the environment. She said the climb was a challenge for her, which is part of her ongoing efforts to prepare herself mentally and physically to achieve her goal of summiting Mount Everest as the first and youngest Jordanian.